About a little over a year and a half ago, I first came across the clip Jammin’ The Blues, which featured amazing dancing by Archie Savage and Marie Bryant. I immediately got infatuated with the crazy switches he does at 1:05, in which he is almost touching the ground. After I went through a phase that I tried to lead them constantly on the social dance floor. 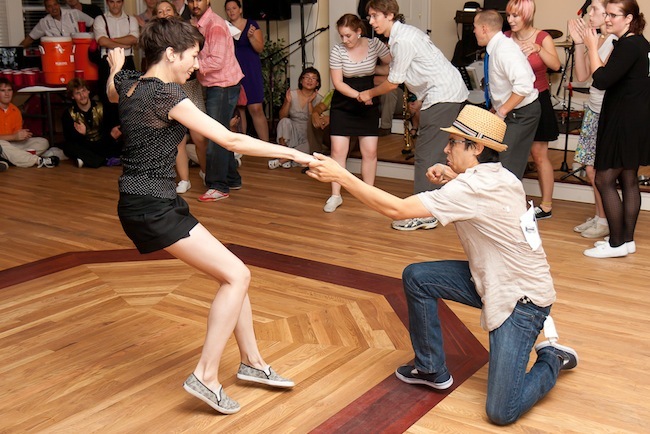 One night when I was dancing at a venue in California, I accidentally lost my balance and fell to the floor on one knee while trying to do Archie’s switches. Like most men when lost and confused, I pretended nothing was awry and kept going with the move. To my astonishment I found out it worked perfectly on one knee and my follow seemed to have a blast with it. This entry was posted on September 7, 2010 by Apache. It was filed under Dance, Lindy Hop, Personal .